Congratulations to Jo & Ben, the first couple ever to marry at Prive 249, in Sofitel Brisbane. The recently refurbished lush decor and furnishings and regal purple space was the perfect venue for their subtle Parisian themed wedding, the Eiffel tower cake stand looked great and the venue was just perfect for their small intimate wedding ceremony and reception. Wishing this gorgeous couple all the very best for your future together and wishing you an amazing 2 month honeymoon in Europe, starting where else but Paris! P.S. 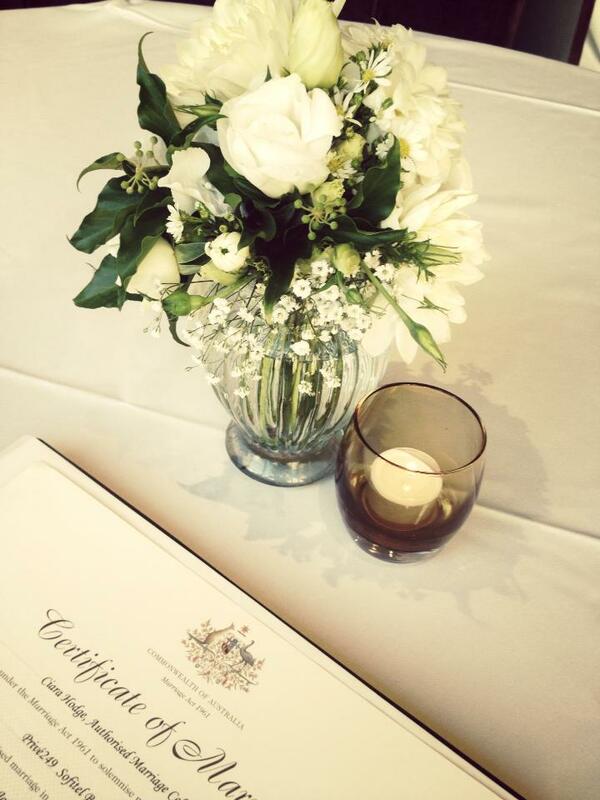 We are perfectionists here at Brisbane City Celebrants and always provide our couples with laser printed marriage certificates, no scruffy writing in sight here!